Same review I posted to TripAdviser: Fun for anyone and amazing if you have feet/leg issues that keep you from skiing. As others have said, Roger is very helpful and responsive to any questions in getting you set up to ride. Day 1 (yesterday) my wife and I both started at their Breck location for the brief and yes, you have to walk to the Quicksilver lift (1,100 feet) but our briefer - Tom - carried my wife's bike the last half just to make it easier on her. We both got up and down the hill multiple times without any problems and a whole lot of fun. It was snowing and we had good powder so until we learned better we had to either walk or skate the bike if we didn't carry enough speed onto flat spots. Day 2 (today) my wife went back to skis and i rode the snowbike again. No powder but groomed runs were great and with 2nd day confidence it was easier to carry speed through any flat run-outs. I'm looking forward to Day 3 & 4. 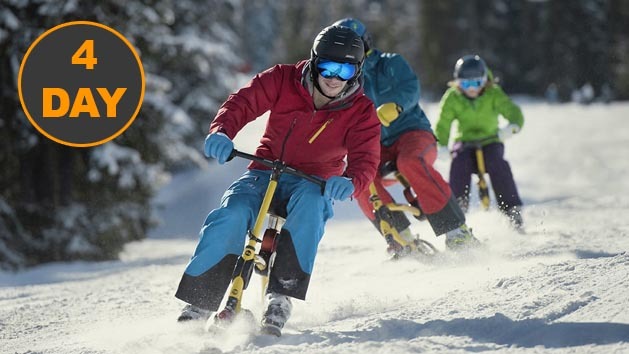 The bottom line - I recommend anyone with foot/leg issues (mine is nerve damage in both feet) give Roger's Snowbikes a try if they want to join their friends or family on the slopes. I also recommend it for anyone else you just wants to have an easy fun day on the slopes or wants to give their legs a break from skiing. I can't tell you the number of times we were stopped by folks wanting to know about the snowbikes - everyone thought they were cool. I would highly recommend ski biking for anyone that wants the joy of skiing without the knee pain. Roger and his team do a great job. I've now got my wife and one of my sons ski biking with me.